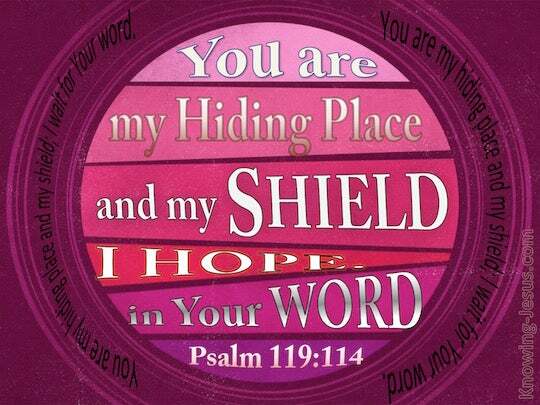 ﻿ Psalm 119:114 You are my hiding place and my shield. I hope in your word. You are my fortress and shield; I hope in your word. Thou are my hiding place and my shield. I hope in thy word. You are my secret place and my breastplate against danger; my hope is in your word. Thou my hiding and my shield: I hoped for thy word. 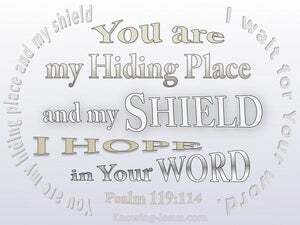 You [are] my hiding place and my shield; I hope in your word. 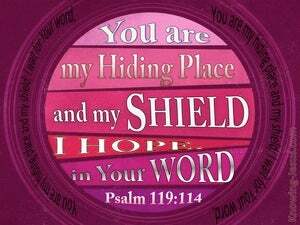 You are my hiding-place and my shield; I hope in Your Word. Thou art my defense and shield; and my trust is in thy word. My hiding-place and my buckler, thou art, For thy word, have I waited. 113 I hate double-minded men, but I love your law. 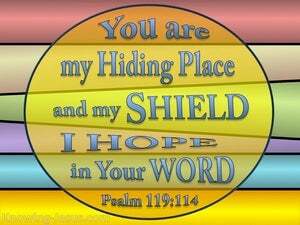 114 You are my hiding place and my shield. I hope in your word. 115 Depart from me, you evildoers, that I may keep the commandments of my God. You are my hiding place. You will preserve me from trouble. You will surround me with songs of deliverance. Selah. I wait for Yahweh. My soul waits. I hope in his word.